When it comes to holiday meal preparations, you can’t forget about the most important thing – the bread! 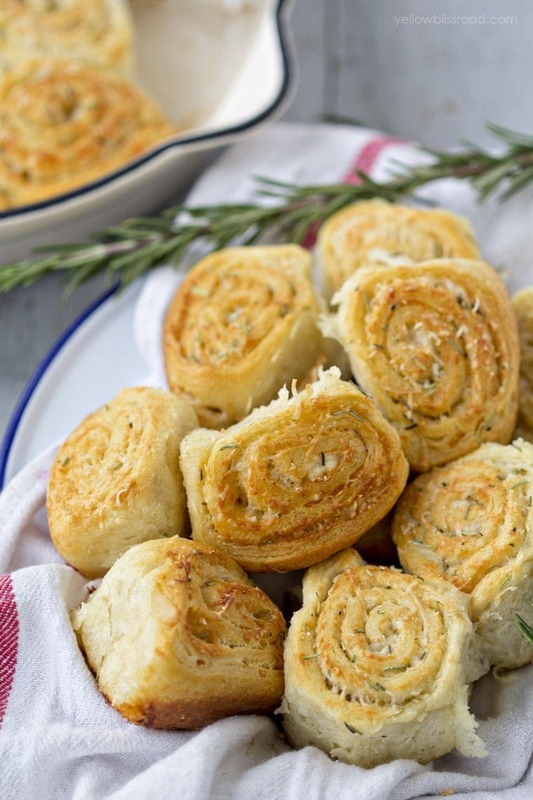 These super easy and incredibly delicious Parmesan Rosemary Rolls look beautiful, and will be the hit of your celebrations, and no one will now just how easy they were to make! I’ve got several recipes on my site that use Pillsbury Crescents. 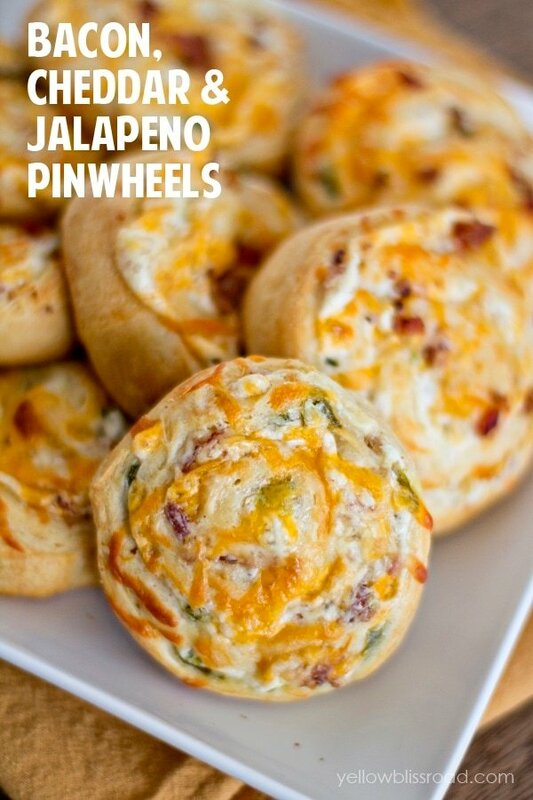 They are definitely a staple in our home, especially during the busy holidays. There’s nothing like warm bread to compliment a meal, whether you eat them plain or dress them up like I did here with some fresh rosemary, fresh grated Parmesan cheese and sea salt. Instead of rolling them into a traditional crescent shape, I decided to make these pretty pinwheels. 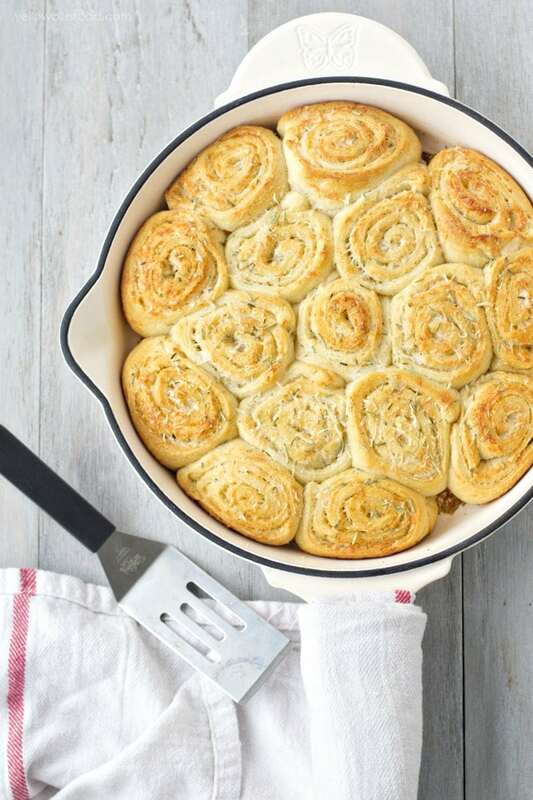 Baked up in a cast iron skillet these cheesy, savory rolls are pretty enough to go straight from the oven to the table and can be served right out of the skillet. 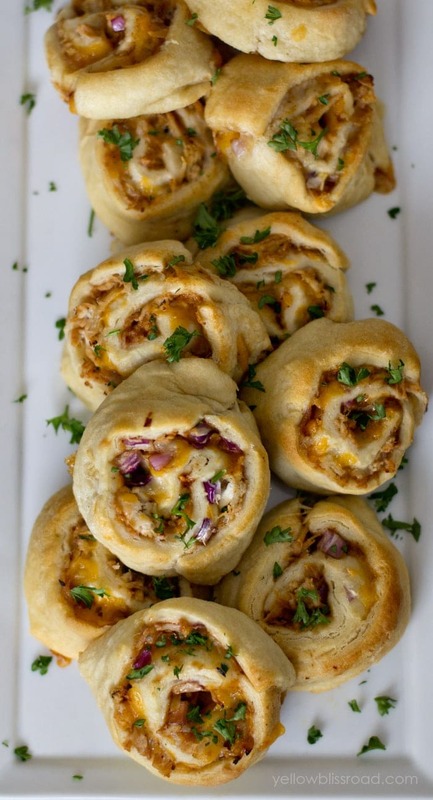 To make these delicious rolls, I used two packages of Pillsbury Crescent Rolls that I purchased at Walmart. Depending on how you slice them, you can get about 16-18 rolls. 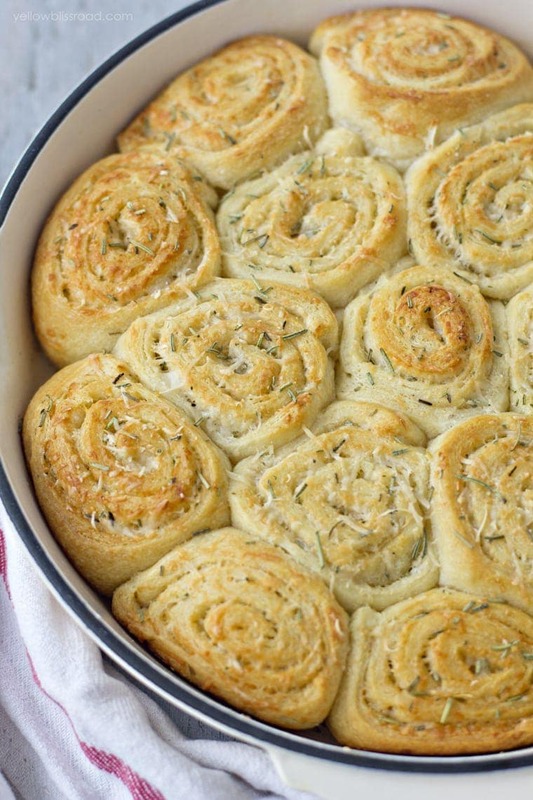 The dough is rolled out with the seems pressed together to form a sheet, and then sprinkled with freshly shredded Parmesan Cheese and fresh or dried rosemary and then rolled up and sliced. Dried Rosemary is fine, but don’t skimp on the Parmesan – get the block and grate it yourself. I promise you’ll notice a difference! Melt some butter in the skillet and fit the rolls in snugly, then brush them with a little more butter and sprinkle on more cheese. Because, why not? 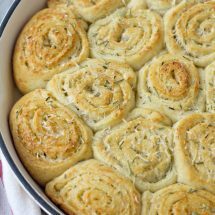 The result is tender, chewy and mouth-watering dinner rolls that will have your guests wondering how you had time to do anything else. Preheat oven to 350 degrees. Place skillet with 2 tablespoons of butter in the oven to melt. Working with one tube at a time, roll out dough and press seams together to form a sheet. Sprinkle with 1/2 of the Parmesan and 1/2 of the rosemary. Feel free use more cheese if you want it extra cheesy. 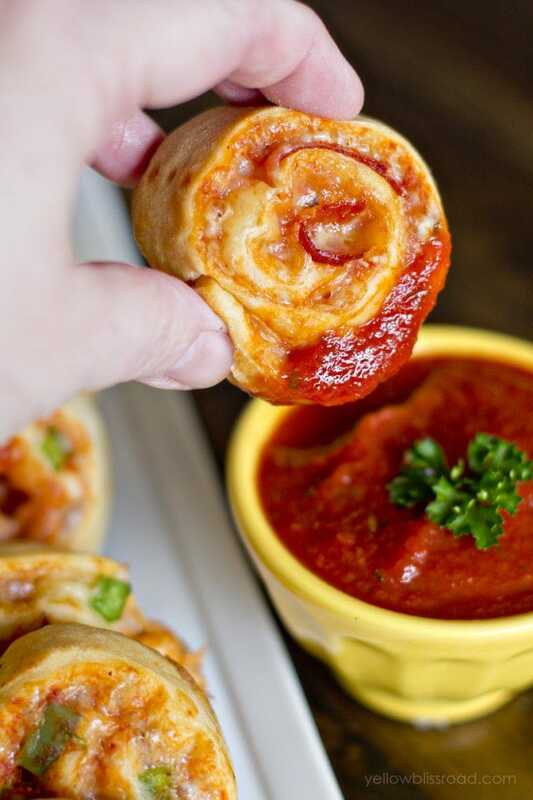 Roll up the dough lengthwise and slice into approximately 1" pieces. Repeat with the second tube of dough and remaining cheese and rosemary. Remove the skillet from the oven and brush butter around the bottom and sides of the skillet. Arrange dough slices in the skillet (they will fit snugly). Melt the remaining 2 tablespoons of butter in the microwave and brush over the top of the rolls. Sprinkle with extra cheese, rosemary and a pinch of kosher salt if desired. Bake for 10-12 minutes or until bread is golden brown. Cool slightly and serve right out of the skillet. Girl, you are amazing. Thank you for sharing your talent! I’m going to use a couple of your delish sounding recipes for our Easter Dinner. Thanks again, Kristin. Thanks Bianca! Thank you for stopping by! Hi Kristin- Can I bake the Parmesan rosemary dinner rolls in a cast-iron pan? if so would I adjust the oven temperature? Yes you can, and no adjusts would be needed. I’d brush the pan with a little melted butter first. Yum! How many rolls does it make? It should make about 14-16 rolls. Do you think I can make the dough/parm ahead and keep in the fridge until ready to bake? Probably…because it’s the canned dough, I can’t say for sure that would work. 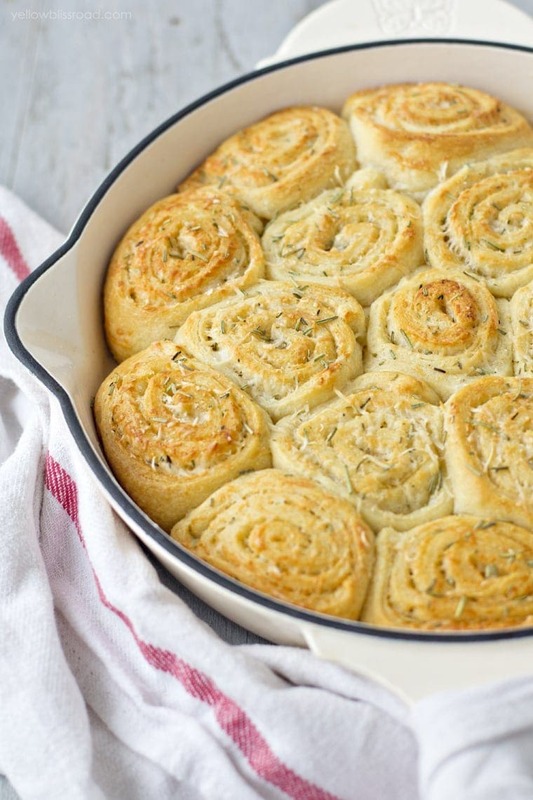 I am making these delicious-looking rolls for my family’s Easter dinner. I used the crescent sheets, and they were very easy to use. They are all ready for the oven. I am keeping my fingers crossed that they will be as tasty as they look. Bless you, Kristin, for sharing your talents. The one I used is a 10″ but a 12″ would work as well. The rolls would just be more spaced out. Have you tried the crescent sheets? I haven’t tried them for this recipe, but I have used them before. Unfortunately I haven’t been able to find them in my stores. These look gorgeous (and delicious)! Thank you for sharing!